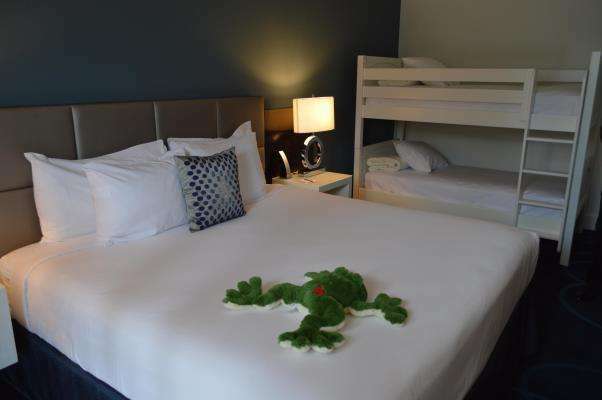 Orlando Fun and Food had the opportunity to tour the new redesigned B resort at the Downtown Disney area of Lake Buena Vista, Florida yesterday. The resort and spa will be officially opening on the 16th, yet some amenities will not be ready until the end of the month. 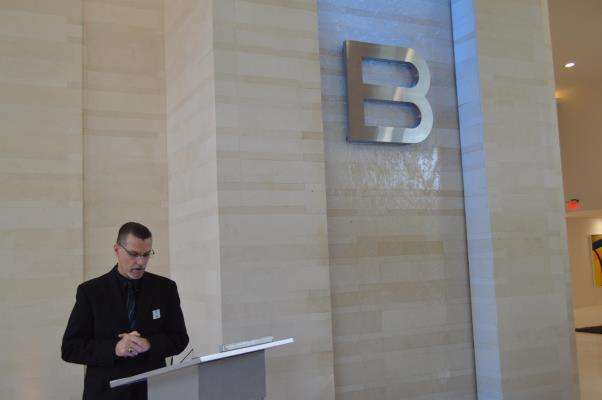 The property, which was once the Royal Plaza, has been totally transformed into the new luxury resort known as the B! This hotel will be the first lifestyle hotels in Central Florida, and also has the only salt water pools in and around Walt Disney World. The resort is located within walking distance of Downtown Disney, and has complimentary shuttle service to the theme parks and Downtown Disney! Here are some amazing facts about the resort and the property! 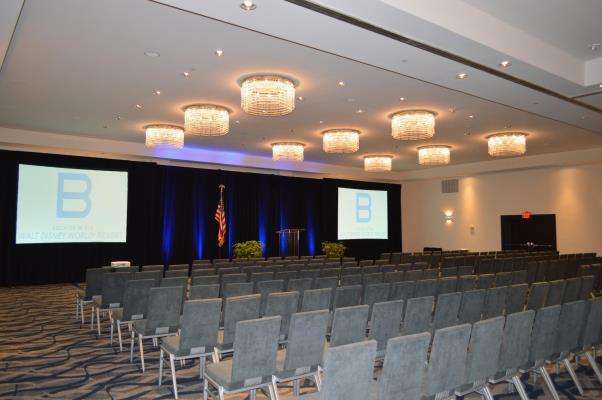 Over 25,000 square feet of indoor and outdoor flexible function space make the B Resort & Spa an ideal venue for meetings, events and weddings for up to 750 guests for banquets and 1,000 in theater style. Catering menus will be designed by China Grill Management, and a separate banquet kitchen allows for the hosting of kosher and other culturally authentic functions. The first full-service B Indulged® by AVEDA Spa will make its debut at the B Resort & Spa and add to the overall lifestyle hotel ambiance. The spa features four treatment rooms, including one for couple therapies, a separate hair salon, nail boutique, relaxation lounge, men’s and women’s locker rooms, and B Active® Fitness Center. Other amenities at the resort include four tennis courts; an outdoor, heated zero-entry pool with interactive water elements and a nearby kids’ zone; a relaxing lobby with comfortable lounge areas; Monscierge® screens and mobile app (the interactive resort/destination guide providing guests with touch screen technology and access to maps, photos, restaurant menus and more); FreeB™ Wi-Fi (complimentary high-speed internet access) throughout the property; valet and self-parking onsite; and complimentary shuttles to the Walt Disney World® Resort Theme Parks. In relationship with Jeffrey Chodorow of China Grill Management, B Resort’s farmhouse chic signature restaurant, American Q, will offer an innovative culinary experience that redefines classic American barbeque. A cross-country selection of BBQ favorites, smoked meats, fish and poultry will be offered both from an à-la-carte menu and an original buffet presentation. Through a large window in the restaurant, diners can peak in on the action and watch as the culinary team smokes mouthwatering meats and rotisserie chicken. Other food and beverage outlets at the resort also include a poolside bar and grill and The Pick Up, a grab ‘n go café with an ice cream parlor. While this resort is not complete yet, it still is amazing. All the amenities will be ready by the end of June, 2014 with exception of the spa which will be ready by early Fall 2014. This resort is a great place to come home to after a long day in the parks. With the shuttle service, 24 hour room service, full service Disney store, and car rental on property to explore the rest of Central Florida, the B resort is going to be a major player in the game! If you book now, you can get a special introductory price of just 99.00 a night plus tax! Opening rates will be 149.00 a night and up! Look below for some amazing pictures of the sneak preview! Who is planning on coming to the B Resort? What do you think of the new look? Orlando Fun and Food will be back once the resort is fully open to review the restaurant and hopefully try out all the amenities!